A Hoosier cabinet is more than just a cabinet; it is an entire kitchen workstation. From its earliest incarnation, it was designed to help the cook do his job more efficiently -- and with less help. Once you know what identifying features to look for in a Hoosier cabinet, it is easy to recognize one. Like this compact kitchen, Hoosier cabinets are a central workplace. In the early 19th century in Albany, Indiana, the Hoosier Manufacturing Company began making cabinets designed to help the housewife save time in the kitchen. While kitchens were large work areas, most of the staples used in everyday cooking were kept in a separate pantry. 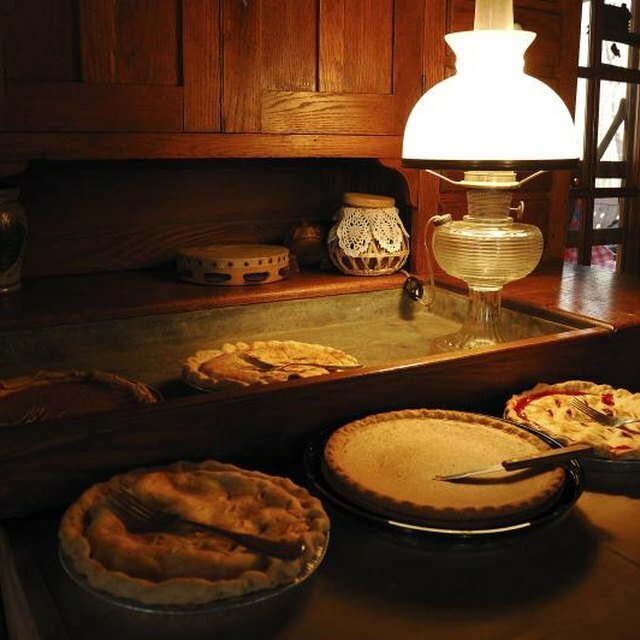 The Hoosier cabinet combined areas for flour, salt and sugar, as well as other ingredients, in one central location. These cabinets also had a sliding or folding work area, further helping to eliminate time spent moving ingredients to a work space. The various features are what separates the different styles of Hoosier cabinets. Spaces for food staples, equipment and spices are the first things to look for when identifying the age of the cabinet. Older cabinets included features such as a flour sifter attached to the flour storage bin and a porcelain-coated steel pull-out work surface. Newer cabinets may have roll-up doors, and a cookbook rack and menu-planning dial. All Hoosier cabinets are made of solid wood, primarily oak. The cabinets look like separate pieces of furniture, as they do not have the toe kicks associated with current kitchen cabinets. Toe kicks are the piece of wood that covers the legs of a cabinet from the floor to the cabinet base. Hoosier cabinets have legs and some have wheeled casters at the end of the legs. Generally the cabinets are 6 feet tall, 2 feet deep and 4 feet wide, which allows a person to stand directly in front of one and be able to reach any area of the cabinet. Older cabinets were stained, and it was not until the 1920s that painting and decorating the cabinets came into vogue. At that point, enamel paint and contrasting stenciling in the Art Deco style was popular. The Art Deco era changed the look of the Hoosier cabinet even if the basic design did not change. Before the late 1920s and 30s, cabinets were utilitarian, with basic hinges and drawer pulls. Identifying characteristics of the Art Deco pieces include inlay of ivory and exotic woods, and handles and hinges made of silver or aluminum and plastics. Less expensive options included paint and stencils instead of the inlay. Later cabinets returned to a less ornate style.